•	Reminded the Club that our next two meetings will be in the new cafeteria at the Huot Center of LHS, prepared and served by the Laconia High School Key Club. Parking is recommended near the new addition close to the large glass panels of the cafeteria. CAUTION: Do not park in the Auto Parts parking lot. You will be towed. •	Read a thank you card from Betsey Weller for her Christmas gift. To read that card, “click” here. Kathy Calvin passed out a sign-up sheet for the February 10th Kiwanis KARES event at Elm Street School, which will take place from 9:30-10:30. The March KARES will be held at Woodland Heights School. Time and date will be forthcoming. Larry Murphy took a few moments to share details of Ed Merski’s situation, and strongly encouraged members to send Ed a card. Ed is home, but still recovering. Joanne is providing extensive care, however, any physical activity normally handled outside the home is not getting done. If you have time to help, please do, but at least send a card. $1 from President Jack for having his daughter, Samantha, home for three weeks from school. She is now back in class today. Phil Bonafide refers to these as unhappy dollars; three $1 fines for no Kiwanis pin. Betty Ballantyne, Joe Adrignola and Scott Laurent are the guilty parties. Phil relished being judge and jury. 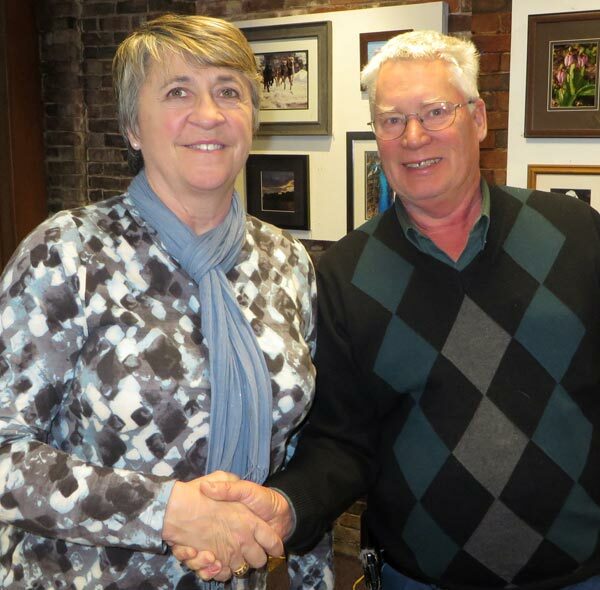 Betty Ballantyne introduced David Stamps, Treasurer of the Board of Directors of the Belknap Mill. 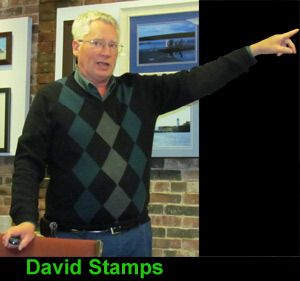 David provided an historically rich presentation on the Belknap Mill and appealed to the club to consider volunteering there. Arts-History-Education is what they are all about and they are growing, thriving, and wanting to do more. The Mill was built in 1823 (30 years before Joe’s Place), and is one of 30 Historical Landmarks along the Winnipesaukee River. It evolved to becoming a hosiery mill and was important during the Civil War. It was electrified in 1918 so as to run shift work for 24 hours per day to support the WWI war effort. It was closed in 1968 after years of decline, but a Save the Mill society, begun in 1970, successfully fought to prevent its demolition. In 1973, the Belknap Mill became a National Historic Landmark, and, in 1976 it was designated the State of NH Meetinghouse. The Belknap Mill currently hosts 12,000 visitors a year, from as many as 31 countries. One of its major programs is the 4th Grade Program where over 4,000 4th graders spend a day learning about the life and working conditions of mill workers in the past. 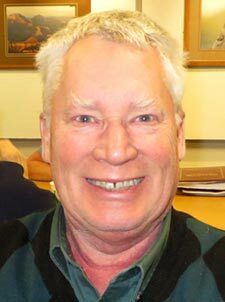 David concluded by saying that if you have not visited the Belknap Mill in the past three months, you are in for a treat at your next visit. The ground floor has been totally reworked and includes several museum rooms and an Art Gallery. With additional volunteers, they can expand what they offer to the public. For more information on the Belknap Mill, “click” here. Betty Ballantyne congratulates David Stamps on his presentation. 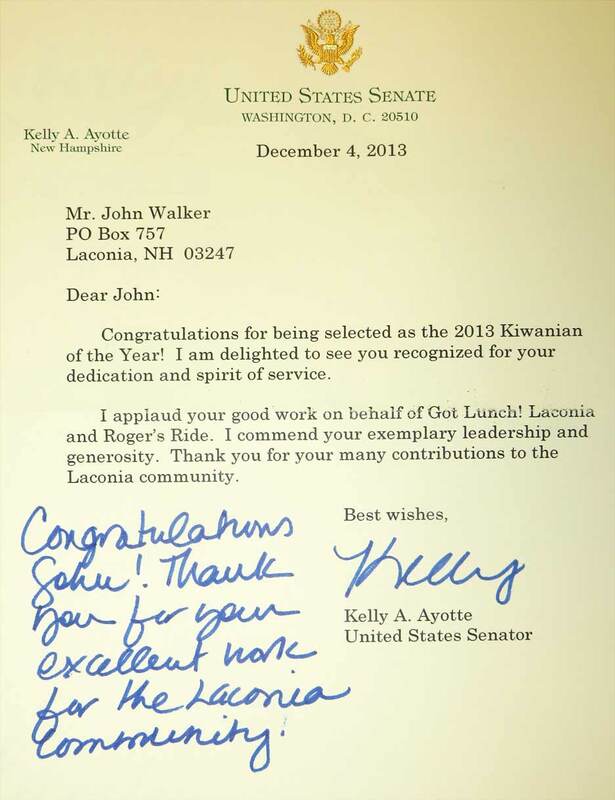 John Walker, received a very special congratulatory letter for being named Kiwanian of the Year. To read that letter, click here. After the invocation at our Kiwanis meetings we frequently sing "God Bless America." However unbeknownst to many there is more to the song than we typically hear. Joe Adrignola found some interesting history behind this song that he thought may be of interest to our readers. For more on the history of the song and additional lyrics, click here.